These past few days have been good. The clearing process of our extra bedroom in preparation for our very special guest next month is almost in full swing. I say almost because it’s really kind of stop-and-go. Tuesday was my most productive day so far. I cleaned, cleared, swept, mopped, dusted and my vanity area now smells of perfume – in the bad sense though! I was so tired by the end of the day as I am right now after an intense baking and photography session that I broke a perfume bottle. It flew right across the furniture, over my head and onto the floor. Boo. Glad to say it wasn’t anything expensive but it was a gift and still I was a bit upset. Those bottles are resilient though – I’m truly impressed. I don’t know anything about their manufacturing process but the bottle just cracked in half. There was a minimal amount of glass shards in the end so there were no unfortunate accidents, thank goodness. However the smell…woah…it has been making me dizzy and no amount of cleaner has made the smell dissipate. It’s still there and still going strong. How my insides felt this morning as I woke up I really cannot describe. Today is Market day in Guildford. I’m not feeling too well so I decided to stay in, but that means I can show you what I brought home with me last month, which in turn inspired something I baked a few weeks ago. By coincidence, or call it what you want, I was thrown in a very entertaining Twitter conversation involving lots of people, including the lovely Signe, a.k.a. Scandilicious. Topic: Brownies. As you may know, Signe is one of my very favourite food writers. What I didn’t know is how seriously she takes brownies. Seriousness/passion scale 1 to 10 = 20. I say this in the most affectionate way, mind you. Why? Because she’s on to something. Brownies have the tendency to be way too sweet, too fudgy, too bitter, too chewy, not too chewy, too bland and too everything. 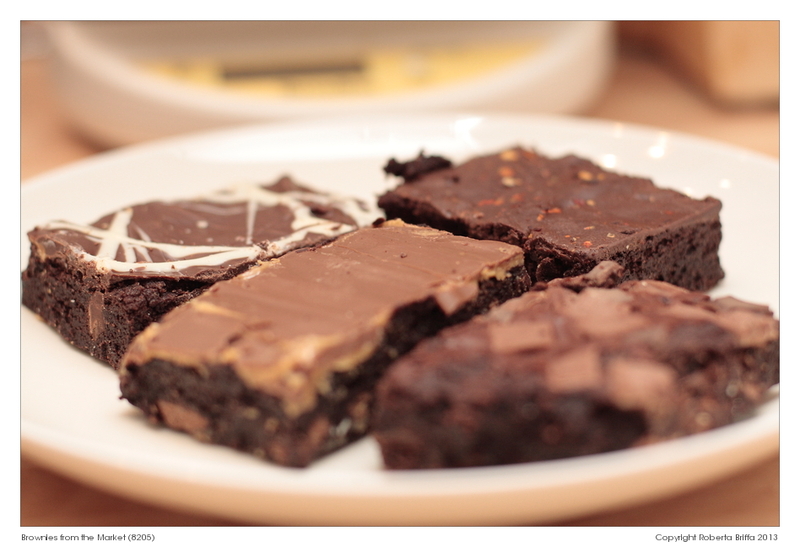 To be honest brownies aren’t one of my first picks when choosing something from the coffee shop or bakery. I prefer a good muffin, though homemade ones are the best. Somehow the ones found in shops, tend to be really dry. The ones you can get in coffee shop chains I mean. But I digress. 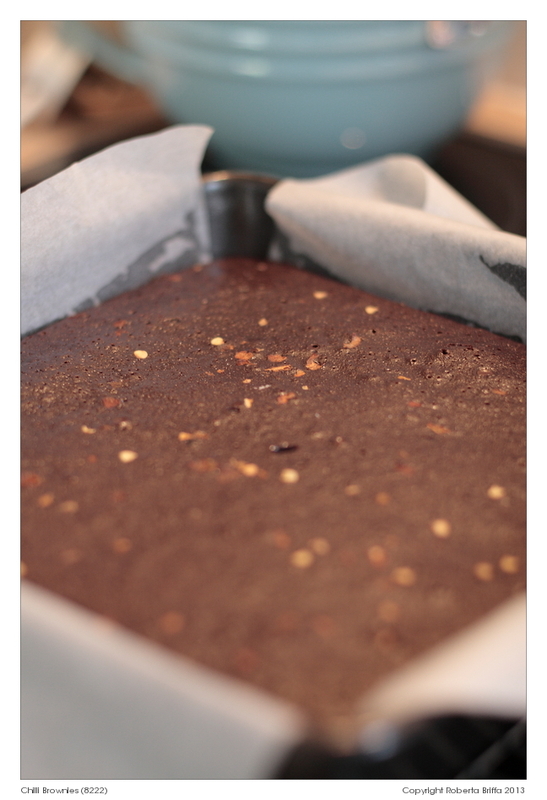 Having said that I love making brownies at home – they are foolproof, easy, quick to assemble and therefore there’s no fuss. These are qualities that appeal to me in the kitchen. I cannot count the times I decided against baking something because of all the faff. I tend to be lazy in that way, yes, but when I’m tired the last thing I want to bake is a croquembouche. Let’s leave that to the pros, shall we? 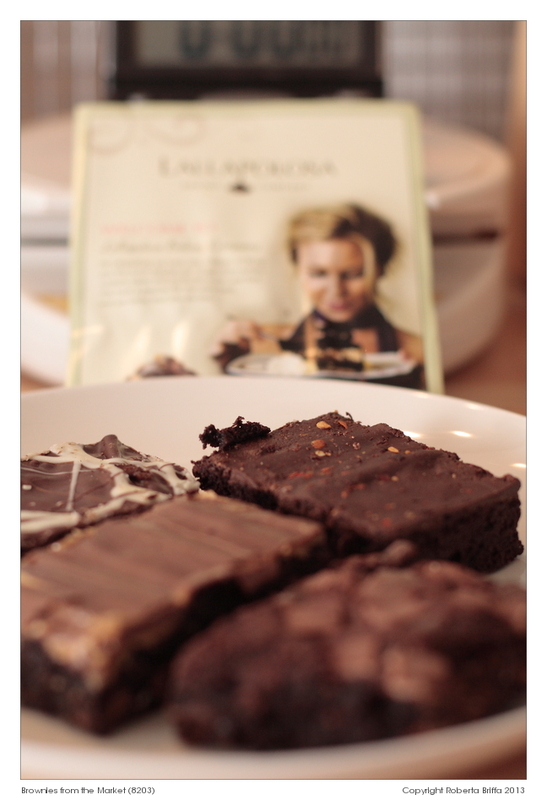 This recipe is Signe’s, from Scandilicious Baking of course. They are seriously ooppss rich. And just for kicks I added dried chilli on top. The taste of these will take some time to develop so don’t expect to taste the full-blown effect instantly. But you will get the chilli hit by day 3. If you keep them in a cool place tightly sealed in a container, and wrapped in their own parchment paper, they will stay fresh. Mine kept for a whole week, and here I must say thankfully! Take your time with them. Preheat the oven to 150ºC/130ºC convection/Gas mark 2. Grease and line with parchment paper a 20 x 20 cm square tin. 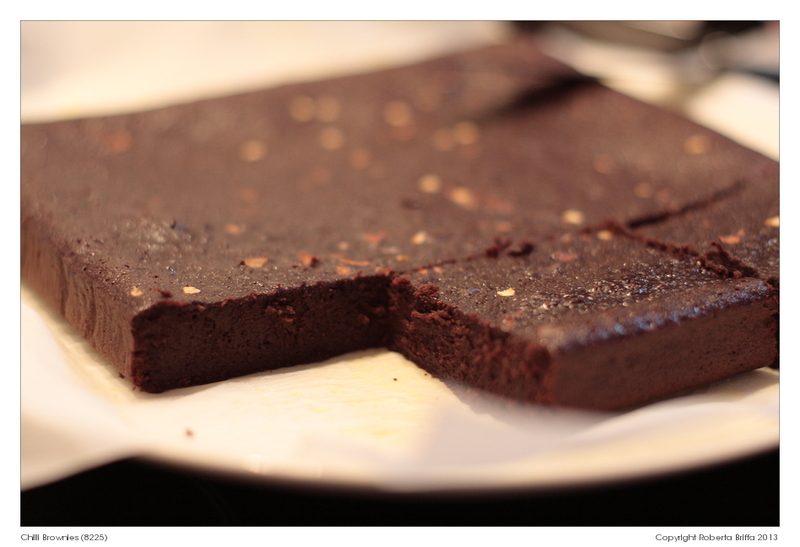 Cut the parchment bigger that needed so that you have a steady hold at the sides when lifting the finished brownies. It takes a bit of extra work but well worth it I promise you. Put the butter in a small pan and melt. Add the cocoa powder and hazelnut spread and give everything a proper mix. Set the mixture aside to cool. In a separate bowl, break the eggs, give them a light whisk, then add the caster sugar and whisk again. Take the cooled chocolate-butter mixture and pour it in the bowl. Now add the plain flour, vanilla extract and salt. Mix everything until the all the ingredients are combined. You will now have a dark, gooey brownie mixture. 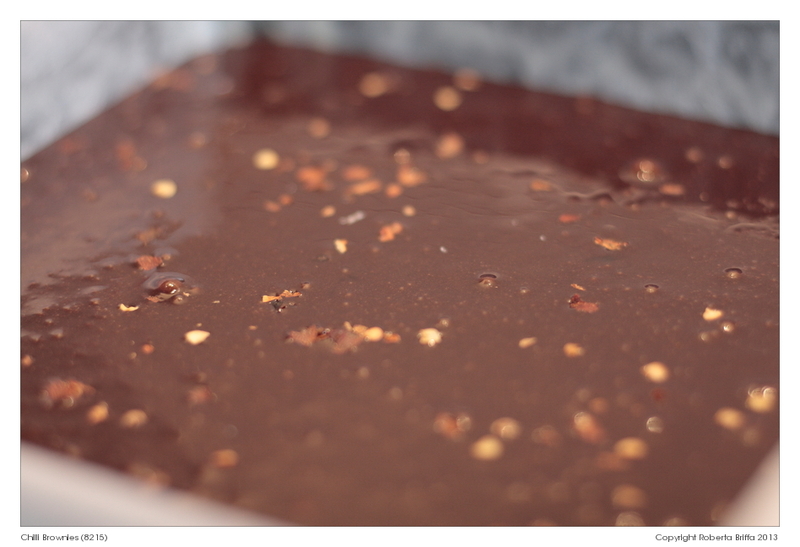 Tip the batter into the prepared tin and sprinkle the dried chilli flakes on top. Bake for around 22 minutes. Around the 20 minute mark, insert a skewer in the middle. 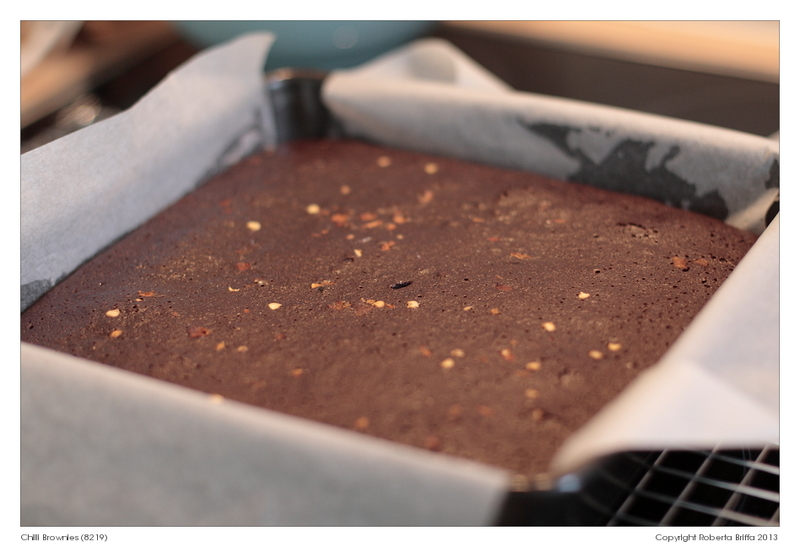 If you see some uncooked mixture on it, then take the brownies out of the oven. They will continue cooking in the tin, so please don’t overbake them. If the skewer comes out clean, you probably left them in the oven for too long. 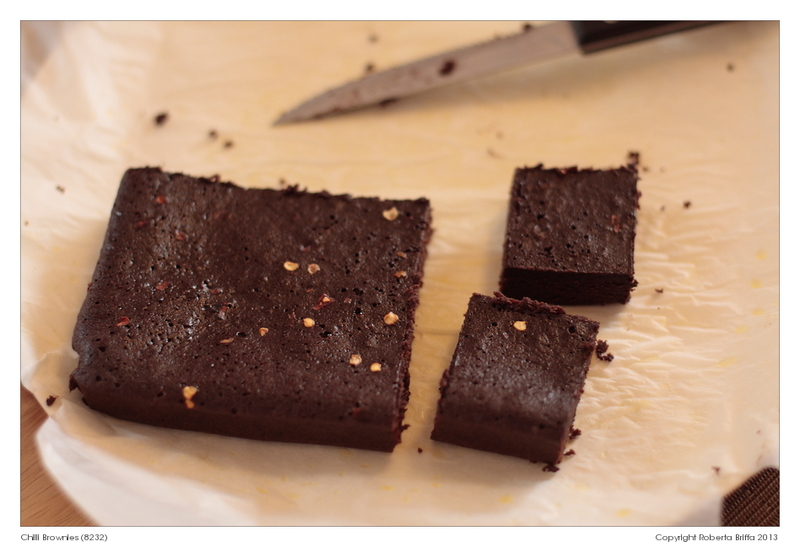 Cool the brownies before cutting them into squares. I told Signe they reminded me of American brownies. They are so different from the ones you get in the UK, which unfortunately tend to lack character. So I have to say this recipe wins hands down. So thanks Sig! And I look forward to seeing what you come up with next. Enjoy! I have to admit I do find it hard sometimes to come up with good veggie dishes. Not out of any lack of love for them; I enjoy shopping at the market stall and often buy more than I need. Typical example: I bought four lovely pomegranates around three weeks ago, just because I didn’t have them in ages. Also they bring such lovely childhood memories of my grandpa that I couldn’t help myself. After five days staring at me from the bowl, the beauties were begging me to eat them. Instead I painstakingly pulled all the seeds out and placed them in a container in the fridge. Did I eat them? No. I had to throw them all away. I won’t tell you the reason why. Shame on me and what a waste! End of confession. I love roasting things though…food I mean. 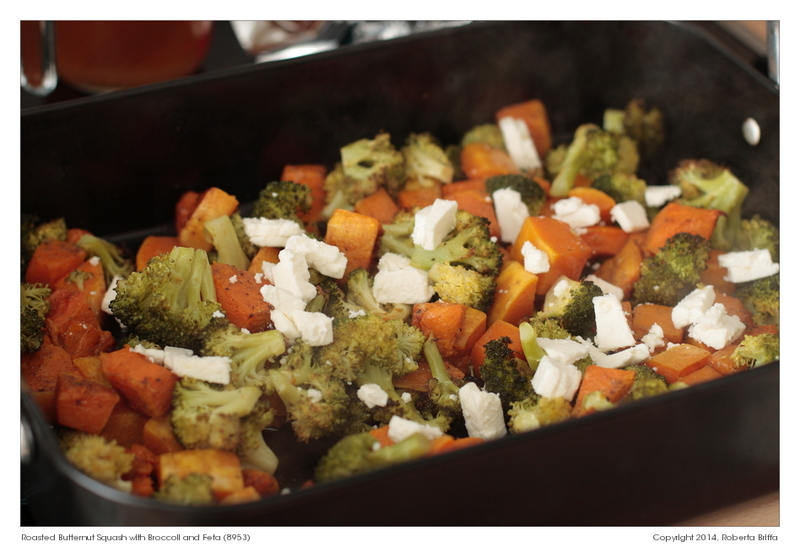 Roasting a chicken is easy; doing the same with vegetables is even easier and the cooking time is much shorter. 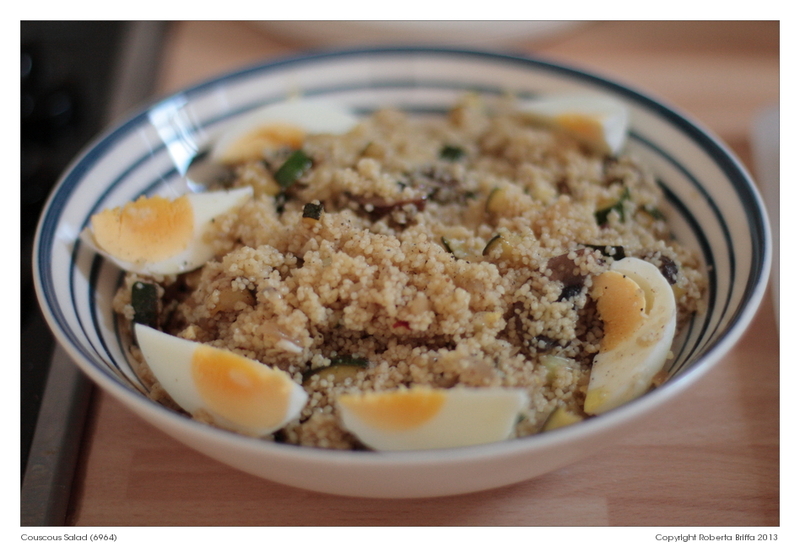 The first few times I did this I made the mistake of cutting the veggies into smallish chunks. The result was a big veggie mush. Not nice. What I do now is this. I cut them into larger pieces, season them with pepper and just a little bit of salt (not too much because I don’t want them to lose too much of their water), dried thyme or any herb of your choice really and plenty of olive oil (not extra virgin though), pop them in the oven for around 30 mins at 180ºC. 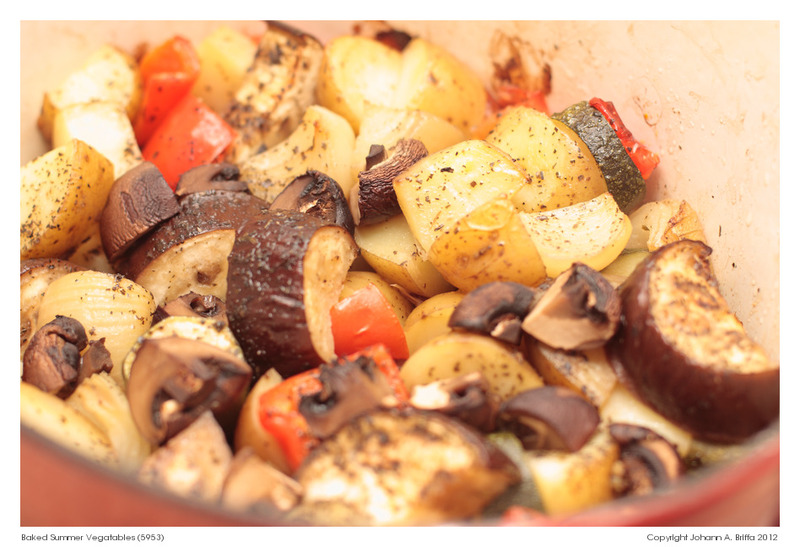 I like a mix of mushrooms, red or white onions or both, potatoes, aubergines and courgettes. But really it can be done with anything you like. 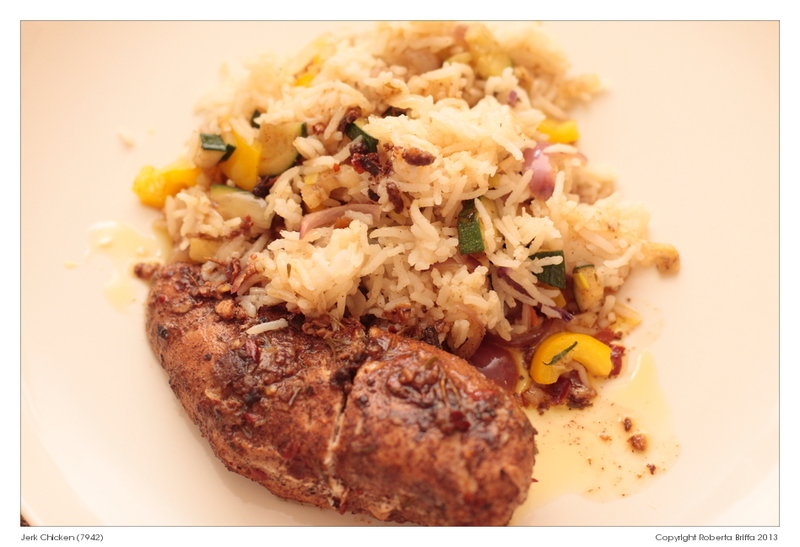 You can serve them with any meat or fish, or even alone with some rice or bread. I make sure to add some chilli then for extra heat. So easy! This is something which we made very recently. 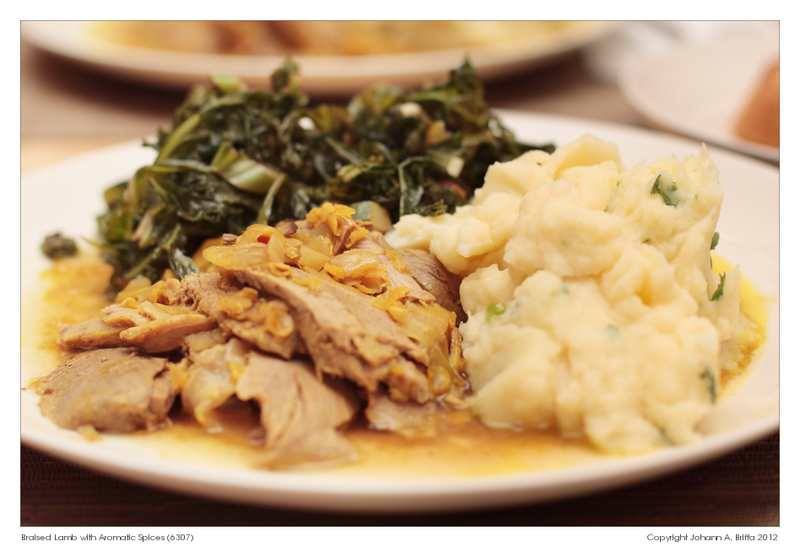 It’s really nothing special but a pork and apple pairing does wonders. 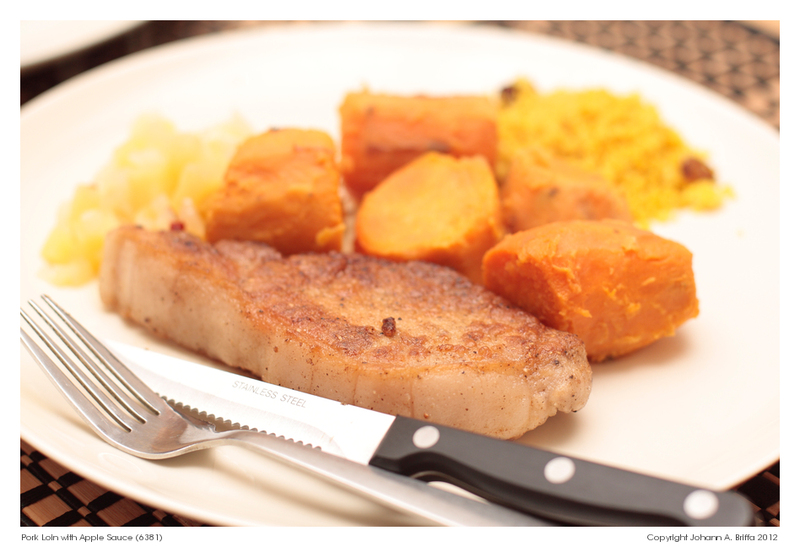 Good quality meat is lovely even all by itself – any good quality ingredient really. However I feel that with some extra effort any meal can be heart-warming or festive. It’s so quick and easy. All you have to do is soften the onions in the butter, with some salt. Peel and cut the apples in bite-seized cubes and add them with the onion mixture. Pour in the gin and lemon juice, add the chilli flakes (or use a fresh one) and mix. Cook on the hob on medium heat for around 20 to 15 minutes. And you’re done. Good with anything. I think I could eat this as is – without the meat. Enjoy!